› Author AffiliationsThe Centre National de la Recherche Scientifique (CNRS) and Aix-Marseille Université are gratefully acknowledged for financial support. 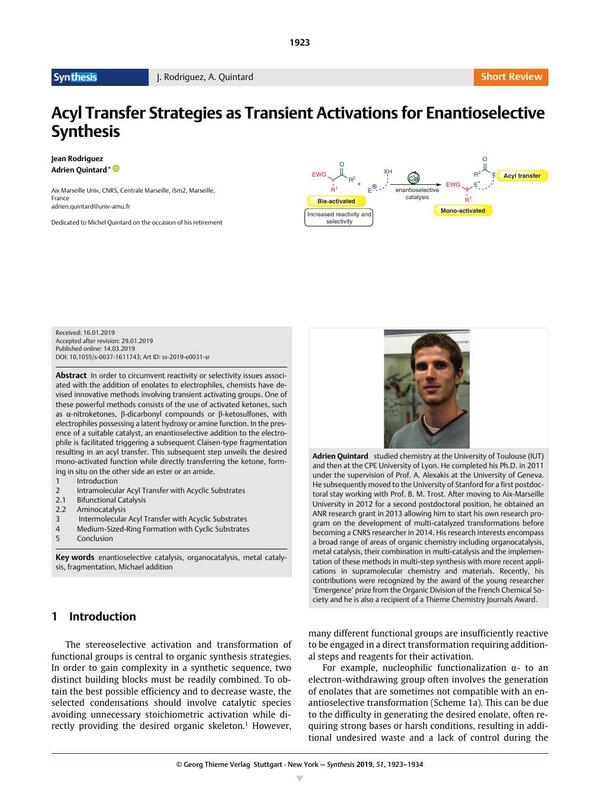 In order to circumvent reactivity or selectivity issues associated with the addition of enolates to electrophiles, chemists have devised innovative methods involving transient activating groups. One of these powerful methods consists of the use of activated ketones, such as α-nitroketones, β-dicarbonyl compounds or β-ketosulfones, with electrophiles possessing a latent hydroxy or amine function. In the presence of a suitable catalyst, an enantioselective addition to the electrophile is facilitated triggering a subsequent Claisen-type fragmentation resulting in an acyl transfer. This subsequent step unveils the desired mono-activated function while directly transferring the ketone, forming in situ on the other side an ester or an amide.